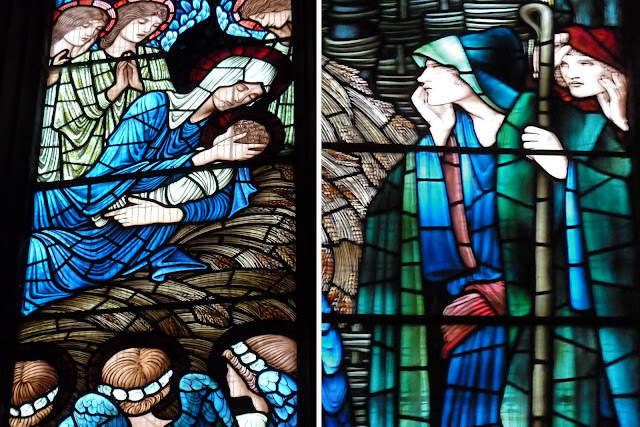 Details from Nativity window by Burne-Jones and Morris & Co. Okay, I have to admit that this post is rather incongruous in terms of chronology and theme. The photos are from a trip to north Wales with my family about nine months ago, rather than part of my recent Australian adventures, or even anything more recent. 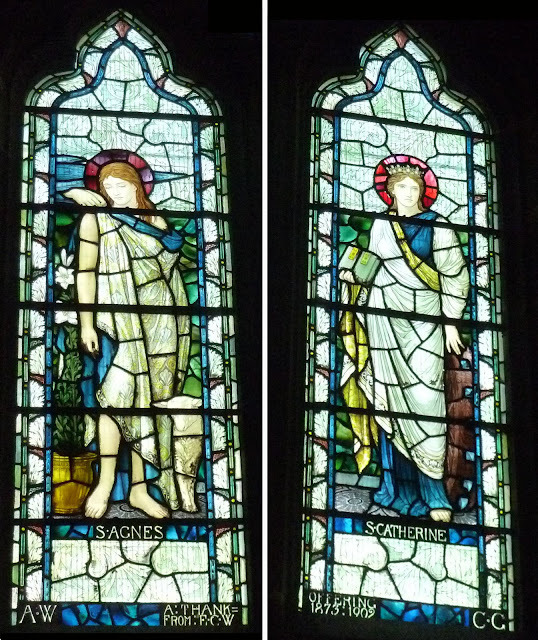 However, it's rather appropriate to show stained glass on a Sunday, I guess... 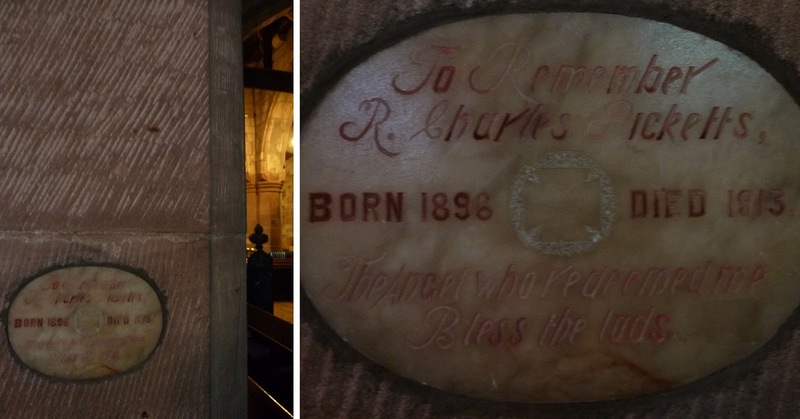 These particular examples are from St Deiniol's church in the small town of Hawarden, near the border. And at the moment, the Pre-Raphaelites have flooded my brain (more on that later...) so it seemed appropriate to share these with you while I was thinking of it, otherwise they would get lost forever in my backlog of pictures. Crucifixion window by Burne-Jones and Morris & Co.
Now, I've been trying to confirm who designed each of these exquisite windows but am having a little difficulty with different sources at the moment. All I know for sure is that the wonderful Edward Burne-Jones was present here. The two ladies above - Fides and Caritas - date to after Burne-Jones's death, but one source I've found claims they are his design... It's possible that they were copied from designs of his used elsewhere previously, as was the case with the Crucifixion window. By the look of them though, they are certainly Morris & Co creations. The violinist angel above is a complete mystery (at least to me). But isn't he absolutely stunning? St Agnes and St Catherine below are by Henry Holiday, and they do seem to have a subtly different style and execution to them... but still utterly lovely. 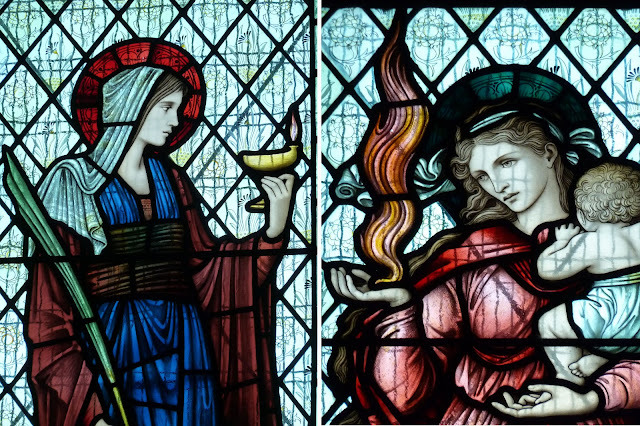 I really love stained glass, and these particular examples are so beautiful, they make me want to weep. The use of colours and the delicacy of the features are incredible and transfixing. I'm glad it's not just me who was overwhelmed by it! It's my pleasure to share such beauty with my readers. I've somehow never made it to Red House... I think it's because it's really in the middle of suburban nowhere now so you know there'll be nothing around once you've explored the house. That's a pretty weak reason though - I really need to get myself out there. Oh yes, truly beautiful and moving the soul! Thank you. I'm so pleased you have identified the angel playing the violin, as "he". AND it would seem that dear R. Charles Ricketts (presumably a man) is considered an angel. What a treasure to find that, almost hidden, stone. Too often angels are thought to be female. In the bible, on the rare occasions they are named, they are male, so they should be painted that way - or androgynous or asexual. Well, I wasn't sure if the angel was a girl or a boy, but it looks like an effeminate boy to me - a similar look to the shepherds (who I presume are boys!). I like boy angels too. Really, I just think there should be more of a mix, as the angels I have encountered in life have been both boys and girls. 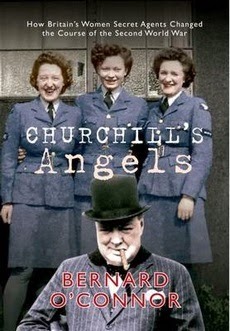 I agree there's too many assumptions in popular culture that angels are female. Oh, yes, yes, yes, I've been to the Pre-Raphaelites! Have just posted my little rant about it yesterday! I went on a Friday night, spent Saturday in a haze and had to go back on the Sunday for more. Like you, I was just overwhelmed.